I introduce you to keyframes by demonstrating how to do an audio fade out. In the process, I show you how to configure your keyframe settings using the Dope Sheet and the Graph Editor. 2:32 – Zoom out all windows for better viewing. 9:15 – Making changes with the Graph Editor. 10:36 – Changing how the transition works. home button in windows ??????? Your videos are fantastic man!!! Thanks so much for putting all these tutorials together. The length and scope of each vid is perfect in my opinion… while many others are creating more daunting 20-40 minute introductory vids. I have a lot of Flash knowledge and some Premiere so I love just being able to dive into the topics I want and then practice what I’ve learned. Still a few more of your vids I need to check off my list but I had to take a sec to say Thanks so much for the really fantastic help! Can you use key frames in the VSE strip window? I want to be able to use the graph editor and dope sheet to loop and reverse video segments. audio reversal with this method? This tutorial series is amazing. I don’t do video work often enough to use and remember all the info, so not only is it comprehensive, it’s also user-friendly. The way it’s been structured and broken down into separate steps is the most helpful thing. Thank you. You are truly a wonderful human being. I quickly figured out how to move around pictures from this video, and it really had me giddy and pacing around with excitement when it actually worked! Like, I’m actually doing some pretty useful and interesting with Blender now! Thank you, thank you so much. Hey Mikeycal, I’m trying to do an audio fade. I’ve done it successfully before using your method. However in this next instance, I seem to be encountering an unusual hitch that I hope I can explain. I insert the audio I wanted. I set the audio to 0.0 volume because I want to fade into it. I insert a keyframe at the start. I move to the next point where I want the volume to be at 1.0 volume. Every time I try to change the volume after the initial keyframe, the volume will reset to the "Default" volume. In this case that’s a volume of Zero. I don’t know how to fix this issue. Can I use keyframes to edit the the curve of transition values? I tried to read most of the comments trying to get the answer – Sorry if you have answered this already. How do you get the "scene" panel back after you finished with the dope sheet and graph editor.. I love the videos! A very good video on keyframes itself. You’re awesome dude, I love your videos. Yes, that’s a good start and see how Blender is powerfull ! nice tutorial however i cannot get back to the UI layout i started with. perhaps you need to show that as well. My blender is so messed up its unusable and ive had to quit using blender. thank you! democratization of knowledge…for free..awesome. I appreciate the Time Index in the comment section! Your lessons are the best. explained in great detail, and noob friendly. I thank you so much. This video is full of keyframing on dope sheet. It’s a dope video. I had to come back to this series to see how to change the interpolation mode. Well done, Mikey. I also saw something I was looking for before, in the graph editor. There’s an icon that looks a blue dot with four right angles around it — I think you can change the pivot point for transformations! Could you cover that in a tutorial? I had a project with transformation with scaling, offsets, AND rotations, but I couldn’t get it to rotate around that point, so I had to hack it by manually making a square image of that area so the center point was also the bounding box center point. 1) After you’ve opened your video in blender add your image (using the Add tab below your strip). 3) Select the transformed strip and from here do all the changes you wish to do to your image such as size and overlay. 4) Here is where the steps in the video above can be applied EXCEPT instead of using volume use IMAGE OFFSET. Y if you want to move it vertically or X if you wish to move it horizontally. I just started using blender, and your videos are really a godsend! Thank you!! I got to #18 and managed to screw up the view, and I can’t get rid of the recursive UI elements! It’s maddening! Problem is I have changes in the screwed up view, which I managed to save after over an hour of messing around with the upper-right / lower-left window/menu handles. I just can’t consistently get the big watermark arrow to show up to dissolve the window. Shame there isn’t a way to reset the UI without affecting the window contents. Also you didn’t define what the purpose of the "dope" & "graph" editor was before you opened them. Hey Thanks again for these videos! My friends and I are also starting a game channel, and I needed something to use to edit . These videos have been a godsend! i also subscribed to your game channel! is a face cam really that important? You are so great GURU (Teacher) ….! I solute you sir!!!! Keep it up!!!!!!!!! I’m having trouble with the audio not rendering with the finished product. Plays in Blender but after rendering, no sound. Audio scrubbing and A/V sync is on. Audio is not muted. Your tutorial is very detailed, very clear. Thank you! Well explained. Keep up the good work. Man, you are a genius! Do you have a tutorial that shows how to track someone elses face (image) over a moving video? Im trying to make a thank you video to say thank you to a couple of people who have helped our community project. I think I’m frustrated more with Blender’s inconsistent behaviour across panes than anything else. I’m trying to do a simple fade-down of music audio as the speaker begins the spiel. You would think this is straight-forward to do, but I’m finding it inordinately difficult, for some reason. The dope-sheet shows me nothing useful at this point. The graph-editor shows me keyframes I can’t do anything with: can’t grab them, edit them or anything. Well, until I hit Tab, anyway: that was key! 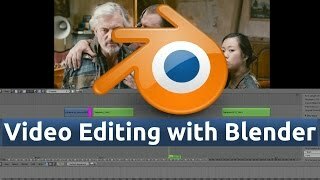 All my current uploaded videos were made with blender Video Editor, all based on what you taught. If you had patience you could see I make one or two videos implementing each lesson, so far I haven’t combined all of them together. One of the great evolutions in the 2.5+ series of Blender is the ability to keyframe practically every setting in the program. The interpolation modes may not make much sense for audio, but are more for animation effects. Such as for a video wipe you could turn off the default fade checkbox on a single wipe and then keyframe the effect fade from 0 to 1 and then change the interpolation mode to bouncing.